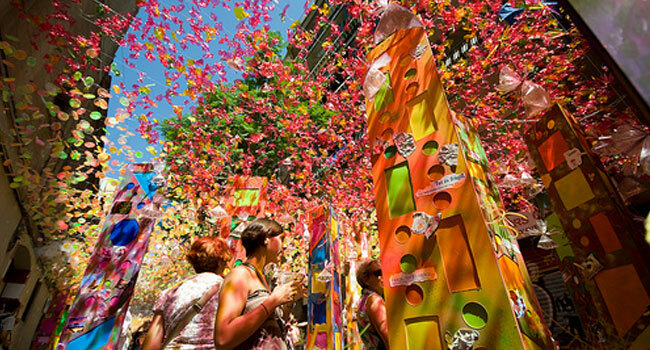 The Festa Major de Gràcia is the high point of August in Barcelona, ​​as during many years in which most of the Barcelonians left the city during this month, these festivities brought life, joy and entertainment in the middle of the hottest month of the year. This year the Festa Major de Gràcia will be held from August 15 to 21. The success of this celebration lies in the great involvement of the neighborhood, which lives the whole week with a lot of passion. Many activities of all kinds are organized: cultural, creative, gastronomic … and there are musical events both during the day and at night. Dance and sports competitions are also organized … but the star and soul contest of the whole festival is the competition of streets and balconies decoration, in which the streets, neighbors and shops of the neighborhood participate. The creations that they make are really spectacular and they manage to immerse you in a different environment each corner. The Festa Major de Gràcia even has its own app so you will not miss anything! Stay with us and enjoy this celebration! La festa de Gràcia fins i tot té la seva pròpia app perquè no et perdis res!